Treatment for drug addiction can take many forms throughout many levels of care. A person with a substance use disorder may be in need of an inpatient hospitalization detox or treatment, a 30 day residential treatment stay, day treatment or partial hospitalization, intensive outpatient (IOP) or outpatient. Additionally, in all these levels of care or treatment settings, one can expect (or at least SHOULD expect) to get a variety of approaches in treatment settings, such as individual treatment, group therapy, family therapy and medical attention from a doctor, sometimes a psychiatrist and sometimes for Medical-Assisted Treatment (MAT). However, in each of these settings and throughout the different levels of addiction treatment, there are several therapy techniques and treatment approaches that are most effectively used in drug treatment. 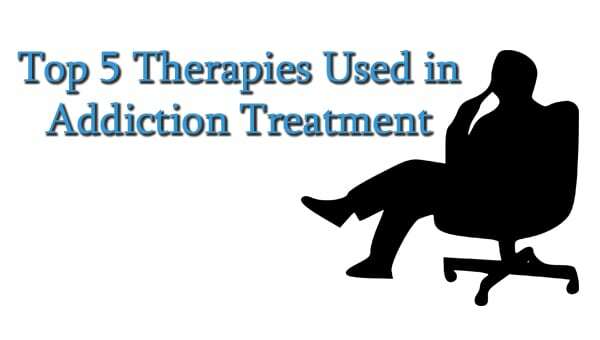 Here are the top 5 therapy approaches used in addiction treatment. Cognitive Behavioral Therapy (or CBT) is a general term for a classification of similar therapies all have similar characteristics. CBT is based on the idea that people’s thoughts cause their feelings and behaviors, not external things like people, situations and events. Therefore, the idea is that if we can change the way we think than we can change the way we feel and act. Therefore, if that is the case, feelings and actions can be positively changed even if situations do not. Dialectical Behavior Therapy (DBT) is a specific type of CBT that was initially developed to better treat borderline personality disorder and since has been used to treat many other kinds of mental health disorders. DBT is a support-oriented system that helps people identify their strengths and build on them. The idea is that some people’s arousal levels increase far more quickly than the average person’s, therefore those people attain a higher level of emotional stimulation and take a significant amount of time to return to baseline levels. Motivational interviewing is a therapy method that deals with identifying and engaging intrinsic motivation within a patient or client in order to effectively change that client’s behavior. Motivational interviewing (or MI) is a goal-oriented, patient-centered style of therapy. It aids in getting the person to identify within themselves what is important, what they want to be, what they want out of life, etc. and then using those internal motivations to change detrimental behaviors. Experiential therapy, unlike the usual or typical “talk therapy”, involves actions, movements and activities to create experiences for clients in order to bring about positive change. Experiential therapy is a therapeutic approach that is often used for client’s dealing with trauma and other subconscious issues through actions and activities such as role playing, guided imagery, acting, use of props and other means to act out previous experiences or future concerns. Examples of experiential therapy are psychodrama, adventure therapy, recreation therapy and music therapy. Addicts and alcoholics are often described a hypersensitive people that have a difficult time living in the present. Rather they are often consumed with fear of the future or guilt, shame and remorse about the past. Mindfulness is a therapy method that looks to address those issues, as mindfulness is a state of active, open attention on the present. When a client is mindful, they observe their own thoughts and feelings while being somewhat detached, without judging those thoughts and feelings as good or bad. The purpose of this technique is to instead of living life as it passes by, mindfulness allows a client to live in the moment and truly experience life as it occurs. If you or someone you know is in need of help because of drug and/or alcohol abuse, please give us a call. Maryland Addiction Recovery Center offers the most comprehensive addiction treatment in the Baltimore City, Baltimore County and entire Maryland area. If we aren’t the best fit for you or your loved one, we will take the necessary time to work with you to find a treatment center or provider that best fits your needs. Please give us a call at (410) 773-0500 or email our team at info@marylandaddictionrecovery.com. For more information on all of our drug and alcohol addiction services and resources, please visit us at www.marylandaddictionrecovery.com.